Scottish designer Ian Callum is the name behind the Jaguar F-TYPE, the first true sports car from this iconic British manufacturer in more than 40 years. Supercharged engines and an 8-speed ZF-supplied automatic transmission move this marvelous, stout cat. If you haven’t looked at Jaguar in some time, then you are missing out on the quiet renaissance that is transforming this quintessential British emblem from a staid, patrician brand to a dynamic, voguish marque. And that transformation is most evident in the rear-wheel-drive Jaguar F-TYPE, a handsome coupe or convertible called by some the spiritual successor to the iconic Jaguar E-TYPE. Four decades have passed since E-TYPE production ended after a 15-model-year run. Since then, Jaguar has gone through multiple permutations, passing from British Leyland ownership to the Ford Motor Company before finding its way to Tata Motors in 2008. Today, the brand is officially part of Jaguar Land Rover Automotive PLC, with its headquarters domiciled in Whitley, Coventry, United Kingdom. Wisely, the Indians are taking a mostly hands-off approach to the co-brands, while investing billions of dollars to modernize the company. Without Tata’s backing, it is doubtful that Jaguar and Land Rover would still be around or at least neither one would be enjoying anything close to its current success. Indeed, the company continues to enjoy record sales and expects to cross the 500,000-unit sales threshold in 2015, with each brand acquiring one new product this year as well. 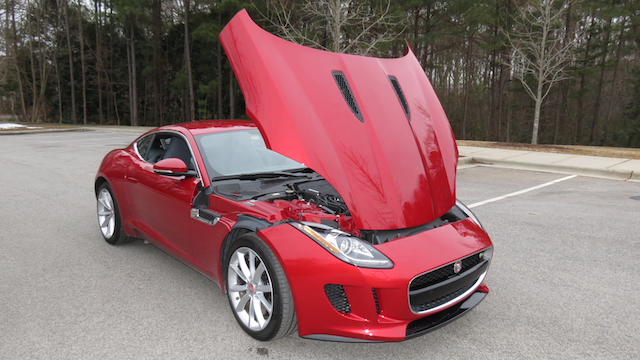 Enough with the background information — the 2015 Jaguar F-TYPE is the focal point here, a tempting two-door sport coupe that I had the pleasure of driving for one all-too-quick week recently. Besides coupe and convertible variants, you get your choice of supercharged 3.0-liter V-6 or 5.0-liter V-8 engines. 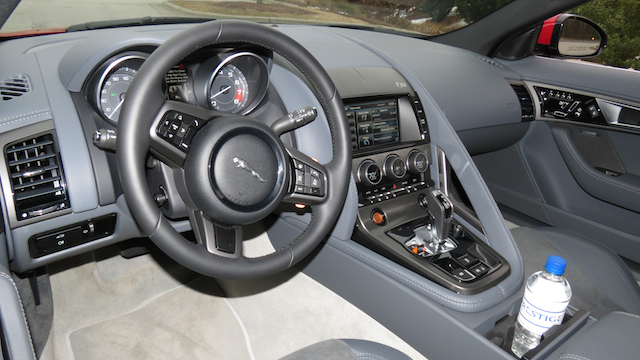 This sports car is built on a rigid bonded and riveted all-aluminum platform and employs am electronic active differential and an all-new torque vectoring system, Both engines are paired with a ZF-supplied eight-speed “quick shift” automatic transmission with manual sequential control attained through the shift lever or via the steering wheel-mounted paddle shifters. The Jaguar F-TYPE is based on the C-X16 concept car designed by Ian Callum, one of the most acclaimed automotive designers of our time. Callum’s handiwork is displayed on certain Aston Martin models as well as on the current Ford Fusion. 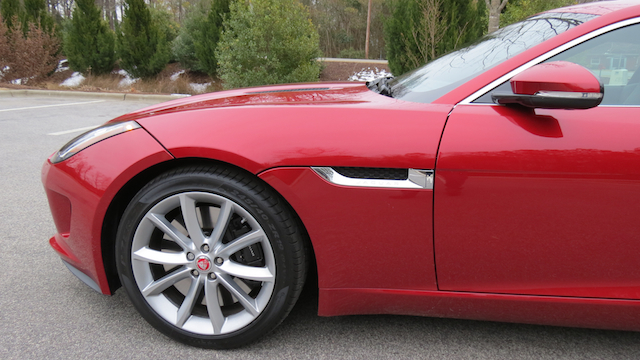 Definitely, the F-TYPE has its own imprint, one that won’t easily be confused with any other vehicle on the market. That luscious design starts with its imposing grille and advances to the dynamic duo “shark gill” openings found on either side of the grille. It continues on to the sport headlamp assemblies, accentuated by boomerang or J-shaped LED daytime running lights. Muscular creases run along the center of hood with active hood vents, front air vents and side vents signaling that this coupe means business. Arcing lines flow out from the LED lamps and pass on both sides of the hood, along the profile and terminates at the rear deck, itself a massive posterior that is marked by a lift gate and a hidden rear spoiler that emerges when your speed hits 70 mph. Slender, wraparound LED tail lamps and a pair of immense, centered-mounted exhaust pipes, round out this model’s exterior design features. Oh, yes, not to be overlooked are the 10-spoke aluminum-alloy wheels set within Pirelli P Zero tires. Inside, you have a cabin that is focused entirely on the driver. Not that the passenger gets short shrift, rather all controls and interfaces are strategically placed and easy to decipher. 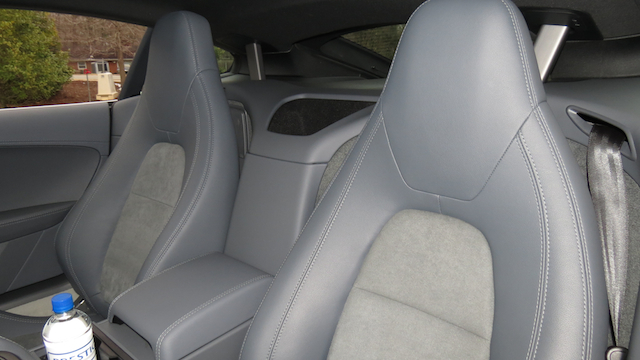 Both performance seats are bolstered, and in the available R-SPEC they come with inflatable side bolsters, the better to keep you in place as you romp around the track. The instrument panel features a two-analog display with the speedometer on the left and the tachometer on the right. In the middle is a driver’s information center, controlled by steering wheel-mounted switches or a stalk located behind the steering wheel on the left. That steering wheel is a three-spoke design and comes with paddle shifters. 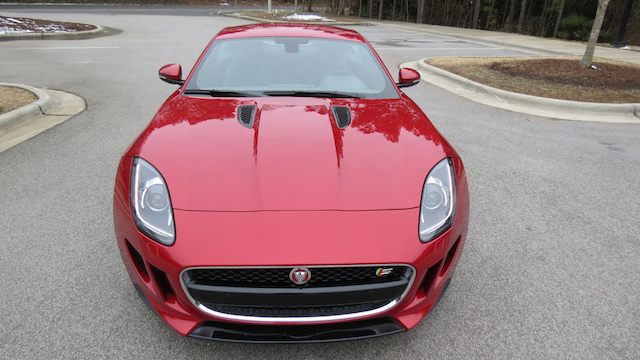 Notably, a flat bottom design accompanies the top-of-the-line F-TYPE R edition. The center stack includes an 8-inch touchscreen to control infotainment and climate systems. 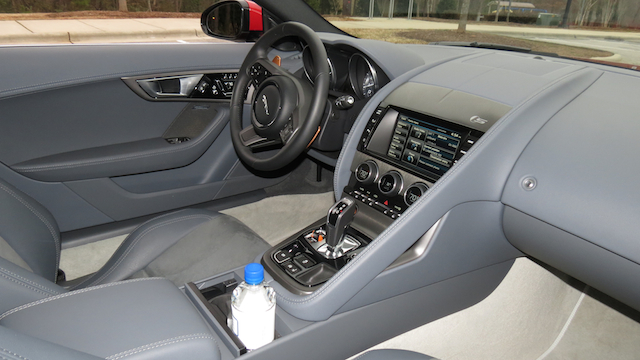 Beneath that are knobs and switches to manage heating and cooling functions, In addition, this Jaguar also has active center air vents, fully deployable when maximum airflow is requested or by overriding a control on the touchscreen to activate same. 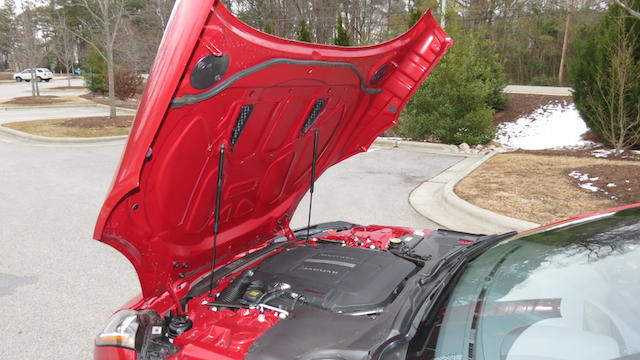 The air vents, along with the door handles and rear spoiler, stay hidden until needed. Rounding out the center console is the drive mode switch with standard, sport and snow modes for your selection. Beneath the shift lever, you can deactivate traction control, operate in economy mode or raise or lower the rear spoiler. In the middle, that is an assist grip running along the base of the center stack — so tell your passenger to shut up and hold on! Two cup holders and the smallest of all storage compartments with two USB ports and an auxiliary input port are found inside. In the background, an open storage area sits between the seats at shoulder level. Further, the tiniest of in-door storage compartments are included and are just large enough to hold a sandwich or an energy bar. 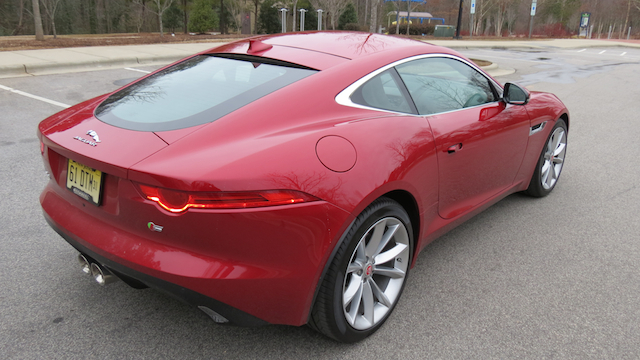 Allow me to share with you my one major beef about the F-TYPE. And that would be its tiny sun visors, each barely large enough to block out the sun. But that isn’t the problem with them: they’re fixed in place and cannot be swung around to the side windows. With a winter sun angled low for a good part of my driving, I found myself adjusting my driving direction to avoid the sun. I also discovered that raising the seat to a certain height helped, but that took away from my driving experience. Please, Jaguar, amend this deficiency at once. As beautiful as this big cat looks lounging around the driveway or in the courtyard, its sheer beastliness becomes evident the moment you engage the ignition. Press the start button and the F-TYPE growls. 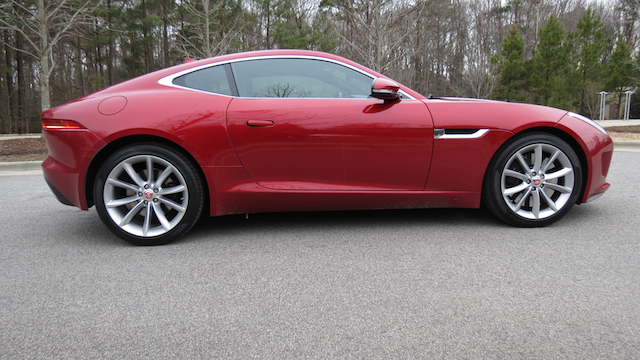 Indeed, that growl — even in the tested F-TYPE S Coupe — is altogether pleasing and will elicit the desired head turns. Shift into gear, step on the accelerator and you will move down the road with alacrity. The S Coupe gains 40 more horsepower than the standard 340 horses for the base V-6, benefiting from a software upgrade. That’s just one part of a $12,000 upgrade that also brings in the limited-slip differential and sport suspension with active dynamics, raising the base price to $77,000. With your foot pressed firmly to the accelerator and the spoiler activated you will fly down any straight away without hesitation. But this model is best enjoyed on curvilinear roads where its handling prowess is evident. A taut suspension, the rigid body and a low to the ground stance conspire to deliver a fantastically capable handling sports car that punches fluidly through every bend, arc and curve. It reminded me of the handling I’ve enjoyed with two other weekly drivers — the BMW M6 and Porsche Cayman S — there is zero fighting with the steering wheel or pleading with the back end to cooperate with the front end. Even with traction control disabled, the big cat kept its claws in place. Whether you choose to operate the F-TYPE in automatic or manual mode, take note of the transmission and how it smoothly and quickly shifts between gears. I am not much of a “manumatic” TYPE of driver, with that manual action often proving disappointing. But not so with the F-TYPE as shifts come smoothly and quickly, and probably faster than what you could achieve with clutch action. Although the 0-to-60 mph gallop is delicious, the fun begins at higher speeds when you’re ready to play with the RPM band. Let me just say that this is one feline that does not flag in zeal and rewards you with growls and purrs to coincide with your foot action or the easing of the same. As with any model, critics have pounced on a few shortcomings inherent to this sports car. Both of those major drawbacks have now been addressed and beginning in 2016, all-wheel drive and a six-speed manual transmission will be made available. Personally, I would stick with rear-wheel drive and, yes, I am intrigued by the manual option. Suffice to say, the quick shifting slushbox was a delight that shouldn’t be easily dismissed. Another positive not previously mentioned is the shallow, but wide storage area discovered when raising the liftgate. 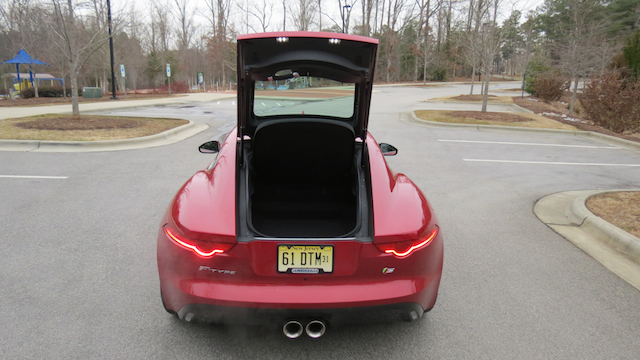 Jaguar says that it is large enough to hold two golf bags. It also seems the ideal place to stuff your luggage for a long weekend getaway with the one you love. As has been noted, there are convertible and V-8 variants available, with final pricing pushing well past the three-digit mark and offering more power than what the average driver likely needs or wants. Therefore, don’t easily dismiss the V-6 as it provides superior performance and a commendable 27 mpg on the highway — the place where you will likely spend the bulk of your driving time. 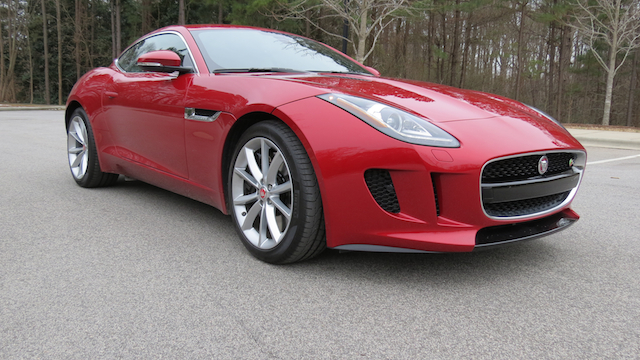 2015 Jaguar F-TYPE photos copyright Auto Trends Magazine.